IS THERE A RELATIONSHIP BETWEEN DIFFERING VOLUMES OF BONE MARROW ASPIRATES AND THEIR CELLULAR COMPOSITION? Importantly, the number of CFU-f in incremental aspirations of over 100 mL have as little as 60 CFU-f / mL. Batinic, D et al “Relationship between differing volumes of bone marrow aspirates and their cellular composition.” Bone Marrow Transplant. 1990 Aug;6(2):103-7. Jing Li; et al “Factors Affecting Mesenchymal Stromal Cells Yield from Bone Marrow Aspiration” Chin J Cancer Res. Mar 2011; 23(1): 43–48. WHAT IS THE OPTIMAL SYRINGE PLUNGER TECHNIQUE AND SYRINGE SIZE TO OPTIMIZE THE RECOVERY OF MARROW DURING ASPIRATION? Gronkjaer et al researched the question of whether a gentle pull of the syringe plunger or a rapid jerk of the plunger, creating a rapid negative pressure inside the syringe, made a difference in the recovery of cells. They determined that a rapid jerk-like motion of the plunger resulted in twice the number of cells compared to gently pulling the plunger. Intuitively this makes sense given the difference in viscosity between blood and marrow. A gentle pull allows the lower viscous blood to begin to flow leaving the higher viscous marrow in tact in the marrow. A rapid jerk of the plunger creates a larger pressure differential at the lumen openings of the needle inside the marrow space. This rapid pressure change does not give the blood a chance to seep into the needle ahead of the marrow. Therefore, with the Marrow Cellution™ system, the approximate 1mL fill should be accomplished by rapidly jerking back the plunger. Each 1 mL fill is accomplished at each new location after turning the handle 360 degrees counter clockwise as the aspiration cannula is removed from the body using the screw set. The plunger should be let go after each additional 1 Ml fill. This will cause the pressure inside the syringe to normalize and therefore the plunger will automatically position itself at the fill line, which should be about 1 mL higher than the previous fill line. Hernigou et al researched whether a larger syringe that creates a greater pressure differential will result in greater cells per mL. For varying volumes of aspirate, they compared a 10mL syringe to a 50mL syringe. They concluded that the optimal syringe size was 10mL combined with a rapid pull of the plunger optimizing the negative pressure. Their rationale for the results was that the resistance of pulling back the 10mL syringe was so much less than the larger syringe. Therefore, the user was able to create a more rapid change in pressure using the 10 mL syringe even though the larger 50 mL syringe was ultimately able to create a greater overall vacuum. Once the less viscous peripheral blood begins to flow, the higher vacuum of the 50 mL syringe worked at cross-purposes to capturing higher viscous marrow cells. They also reported, regardless of syringe size, that greater volumes of marrow from any one location resulted in fewer cells per mL due to infiltrating peripheral blood. Therefore, the optimal technique is to use a 10mL syringe with a rapid plunger motion and with a 1 mL draw from each location. 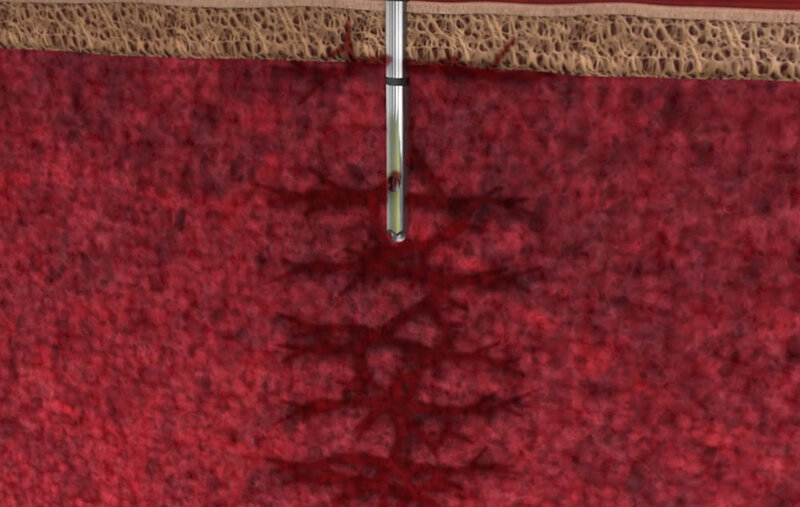 Therefore, with the Marrow Cellution™ system, we provide a 10 mL syringe and at each aspiration site, we teach to fill 1 mL to no more than 2 mL by pulling plunger back to maximum vacuum; release the plunger, move the needle and repeat the process until the needle has been unwound from the body. DO I NEED TO FILTER SPICULES FROM MARROW AFTER ASPIRATION AND ARE RED CELLS A PROBLEM? 1) Ahmadeigi et al ;The aggregate nature of human mesenchymal stromal cells in native bone marrow. Cytotherapy 2012 Sep;14(8):917-24. 2) Ahmadbeigi et al Isolation, Characterization, and Transplantation of Bone Marrow Derived Cell Components with Hemtopoietic Stem Cell Niche Properties Stem Cells Dev. 2013 Dec 1; 22(23): 3052–3061. The hematocrit of the product from the needle will be the native hematocrit and will be equal to that of centrifugation protocols but will have a slightly higher number of nucleated red blood cells. Red cells are a natural part of any clot and play a role in the regenerative process; it is not necessary to remove them. 4) Ahmadbeigi et al The aggregate nature of human mesenchymal stromal cells in native bone marrow. Cytotherpy 2012 Sep;14(8):917-24. 1) Gobbi A. Et al “One-Step Cartilage Repair with Bone Marrow Aspirate Concentrated Cells and Collagen Matrix in Full-Thickness Knee Cartilage Lesions; Results at 2-Year Follow-up” Cartilage. 2011 Jul; 2(3): 286–299A. When an aspirate is performed poorly ( i.e. single stick draw using a vac-syringe, aspirate all from one location) the aspirate is comprised mostly of peripheral blood. The density of the float in the marrow kits is greater than the PRP kits and so the BMAC kit will capture more red cells and granulocytes. In the case of a poor aspirate, the only difference between PRP and BMAC, since they are both being made from peripheral blood, is that the BMAC has higher red cells and granulocytes. With a poor aspirate, the higher nucleated cell counts in the centrifugation protocols is due to higher cells from the peripheral blood and not marrow cells. The published literature looks at the number of CFU-F in the marrow product, whether centrifuged or not, to determine the quality of the biologic because CFU-F is found in marrow but not peripheral blood. Clinical results in these peer reviewed journal articles for different muscular skeletal dis-orders were lined to CFU-F in the graft, not the nucleated cell content. Many cell aggregates from the marrow aspirate are as dense as a mature red cell. (1,2) This is the reason why centrifugation protocols get such a low percent recovery of mesenchymal stem cells (CFU-F); they are thrown away with the red cells. Quote from ref 3 below: “The isolated cells from both the upper and lower fractions were characteristic of MSC. Although it is commonly believed that MSC are single suspending mononuclear cells and so are enriched in the upper fraction of Ficoll-Paque after density-gradient separation, our data showed that considerable numbers of these cells were accumulated in the lower fraction.” (3) Lastly, whole blood is used for epidural patches; if red cells were inflammatory, they could not be used near such sensitive tissues. 1) Juopperi TA, Schuler W, Yuan X, Collector MI, Dang CV, Sharkis SJ. Isolation of bone marrow-derived stem cells using density-gradient separation. Experimental hematology 2007;35:335-41. 2) Bhartiya D, Shaikh A, Nagvenkar P, et al. Very small embryonic-like stem cells with maximum regenerative potential get discarded during cord blood banking and bone marrow processing for autologous stem cell therapy. Stem cells and development 2012;21:1-6. WHAT IS THE IMPORTANCE OF CFU-F COUNTS COMPARED TO NUCLEATED CELL COUNTS? WHAT ARE THE DIFFERENT TECHNIQUES TO ASPIRATE MARROW USING A TRADITIONAL NEEDLE AND WHAT CAN I EXPECT FOR CFU-F PER ML USING SUCH TECHNIQUES? Aspirate marrow using a vacuum assisted (vac-lok merit medical) 30mL syringe in different locations as you advance the needle into the marrow space by inserting the blunt stylet for each new depth from which aspirate is taken. Of course, drawing 1mL always gave by far the most cfu-f per mL. (Between 1,500 -2,000 cfu-f per mL) Each additional unit of volume taken from the initial location became significantly contaminated with peripheral blood. For volumes of aspirate greater than 1 mL, there was no benefit to moving the needle forward or backward or leaving it in one place. Sequentially larger volumes of aspirate were always associated with greater peripheral blood contamination. A benefit was achieved by controlling the amount of negative pressure through use of a vac-lok syringe at each staged location for the aspirate as the needle was advanced. Technique 1 and 2 used a 10 mL syringe to aspirate 8-10mL of marrow, with the corresponding mean cfu-f counts being 376 and 356 per mL, respectively. Employing technique 1 and using a 50mL syringe to increase the negative pressure while drawing the 10 mL reduces the cfu-f mL to 180 mL. Employing technique 1 using a 50 mL syringe and increasing the aspirate volume to 50 mL from a single location reduces the cfu-f mL to 95. Employing technique number 2 to aspirate 30 mL with a standard 30 mL syringe produced 52 cfu-f mL. Employing technique 3 to aspirate 30 mL of aspirate using a standard 30 mL syringe resulted in 54 cfu-f per mL. Finally, employing technique 4 to aspirate 30 mL using a vacuum assisted syringe to control the negative pressure at each 5 mL stage as the needle is advanced resulted in 205 cfu-f per mL. The results above demonstrate the effect of peripheral blood contamination associated with larger aspirations of marrow; specifically lower cfu-f per mL. The results outlined above are consistent with the body of scientific literature developed over the last 30 years supporting the use of marrow for pathology and oncology purposes. McLain RF, Fleming JE, Boehm CA, Muschler GF. Aspiration of osteoprogenitor cells for augmenting spinal fusion: comparison of progenitor cell concentrations from the vertebral body and iliac crest. J Bone Joint Surg Am 2005;87:2655-61. Hernigou p; et al. Benefits of small volume and small syringe for bone marrow aspirations of mesenchymal stem cells. Int Orthop. 2013 Nov;37(11):2279-87. Muschler GF, Boehm C, Easley K. Aspiration to obtain osteoblast progenitor cells from human bone marrow: the influence of aspiration volume. J Bone Joint Surg Am 1997;79:1699-709. Hegde V, Shonuga O, Ellis S, et al. A prospective comparison of 3 approved systems for autologous bone marrow concentration demonstrated nonequivalency in progenitor cell number and concentration. Journal of orthopaedic trauma 2014;28:591-8. Jones et al; Rapid intraoperative concentraton of mesenchymal stem cells from bone marrow aspriate Spine Care, Houston TX; Biomet Inc.
WHAT ARE THE LIMITATIONS OF TRADITIONAL NEEDLES AND WHAT IS THE OPTIMAL TECHNIQUE FOR MINIMIZING PERIPHERAL BLOOD DILUTION? Optimal technique for minimizing peripheral blood with a traditional aspiration needle is to perform a single small volume pull (1-2 mL) from the distance most proximal from the entry of the needle. Larger volumes of bone marrow aspirate contain higher amounts of peripheral blood because the cannula is open ended and because traditional needles do not have a mechanical means for precise relocation. Aspirating after retracting the needle exacerbates the problem of peripheral blood contamination by exposing the open ended cannula to the resulting channel that is created by the needle itself and that is filled with peripheral blood. These results confirmed that strict adherence to a specific collection procedure, involving small volume marrow aspirations and multiple puncture sites, results in a product with a high number of early hematopoietic progenitor cells and minimal contamination by peripheral blood. Spitzer et al “The impact of harvest center on quality of marrows collected from unrelated donors.” J Hematother. 1994 Spring;3(1):65- 70. Massachusetts General Hospital, Boston 02114. The data shows that as the aspiration volume increases from any one given site, the concentration of bone marrow derived cells decreases quickly and the fraction of the sample composed of peripheral blood increases. This study shows that marrow harvesting by means of multiple small volume aspirations minimizes the dilution with peripheral blood and results in greater numbers of cells and hemopoietic progenitors. Aspirates of bone marrow demonstrated greater concentrations of mesenchymal stem cells with a 10-ml syringe compared with matched controls using a 50-ml syringe. A larger-volume of aspirate from a given site is contraindicated with the additional volume contributing little to the overall number of bone-marrow cells and results principally in unnecessary blood loss. DOES A SMALL VOLUME ASPIRATE HAVE MORE CFU-F THAN A LARGER DRAW THAT IS THEN VOLUME REDUCED BY CENTRIFUGATION? In order to centrifuge marrow, you need to add 10% by volume anti-coagulant. This dilutes the end product. You do not need to add that volume of anti-coagulant if you are not centrifuging. When you centrifuge marrow, approximately 40% of the stem cells are discarded with the red cells. Stem cells / progenitor cells when they are cycling build up nucleic mass prior to division. At this stage their density increases dramatically to the point where they have a similar density to a red cell. Centrifugation protocols capture a range of cells based on density. In any given aspirate, approximately 40% of the stem cells have density outside what is typically captured in the buffy coat. Typically, the centrifugation protocol volume reduces the aspirate from 60cc to 10cc. This 10cc is then used to hydrate the substrate. However, in order to reverse the effect of the anti-coagualnt, to make the marrow clot, about 1cc of calcium chloride and thrombin is mixed with the concentrate; another 10% dilution. A centrifuge does not distinguish between nucleated cell from marrow verses blood. So a sample may have a lot of nucleated cells but very few came from marrow. A CFU-f test is often performed on marrow aspirate because CFU-f are found in marrow but not blood. Finally, there is no way to draw 60cc of marrow, no matter how careful, and not get significant peripheral blood dilution. A careful draw of 60cc with multiple punctures typically, at best, gets on average 300 cfu-f per mL. This compares to 2,000 CFU-f per mL drawn from a single site in the marrow. Juopperi TA, Schuler W, Yuan X, Collector MI, Dang CV, Sharkis SJ. Isolation of bone marrow-derived stem cells using density-gradient separation. Experimental hematology 2007;35:335-41. Bhartiya D, Shaikh A, Nagvenkar P, et al. Very small embryonic-like stem cells with maximum regenerative potential get discarded during cord blood banking and bone marrow processing for autologous stem cell therapy. Stem cells and development 2012;21:1-6.